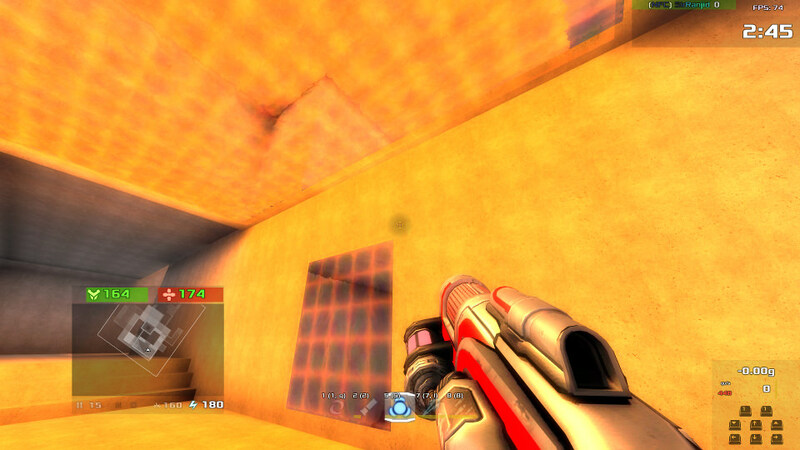 * Toasters may have framerate issues because of the reflections, warpzones, and some water effects. * Recently I tested this map and I noticed on the same hardware Windows 7 running Xonotic has less of a performance impact on framerate than Linux running Xonotic. I made a new map and excited to share. Started last Friday with the layout and geometry, then did touch up's and extra editing on Saturday and Sunday. Then pk3 packaging and some initial matches on Monday. Overall a very short process, and the beta phase of the map is balancing item placements. 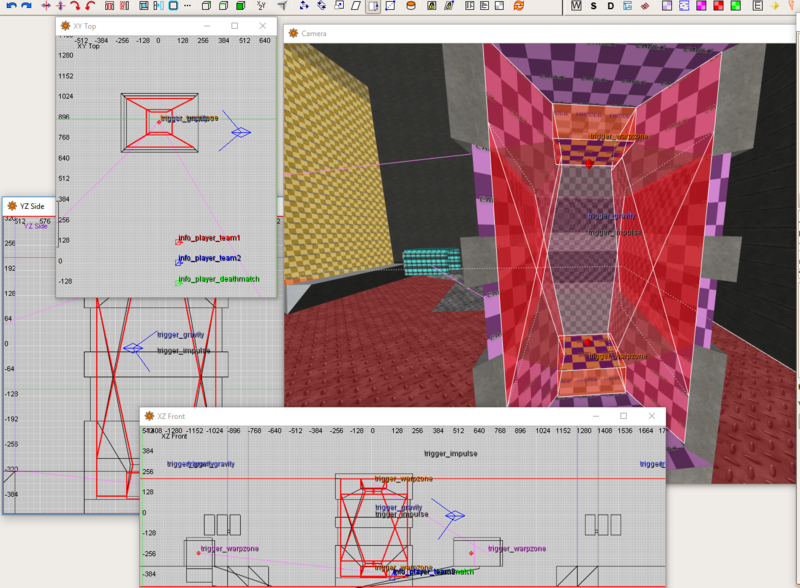 On the design, I wanted it to be a blatant Xonotic map that couldn't be mistaken for a Quake port. Thus I have added many warpzones and many fights are set up for that. One of the goals was for beginner or intermediate players to immediately realize Xonotic's concepts and get an introduction to Xonotic concepts such as ramp jumping, rocket curving, and reliable ricochets without changing the game balance or removing features. Infrequently on servers do I see DM pubs attempt to use ramps or intermediate to advanced movement, so I'm very happy to see some of them trying some of the ramp jumps on this map. There is a separate .ent file because item placements have changed a bit from feedback from initial matches. I did an uncommon something and made red warpzones. Players can not pass through red warpzones, only projectiles; however they can pass through seemless and blue warpzones. The concept is fun, you can do a lot of crazy stuff with warpzone (in fact, I think they might be the coolest Xonotic feature of all times) and you do it well here. The warpzone mayhem you got here is interesting. One thing though: I don't think a got a toaster (ThinkPad X230), but I had some framerate issues. So yeah, I don't know if optimization would change anything (or if it's even possible) afterwards, but maybe. Indeed. I wanted to make the warpzone and physical impossibility very blatant. Sometimes they go unnoticed, and in terms of gameplay, just considered simple doors with an extra glow until someone realizes their position and path. Often I see the accusation that "Xonotic is just a Quake clone so why not just play Quake", so I wanted a map where someone immediately notices the difference. As for performance, I don't know if there's anything significant that I can do as a mapper. I'd re-estimate that people with a dedicated GPU wouldn't have issues. (08-31-2017, 01:32 PM)Antares* Wrote: As for performance, I don't know if there's anything significant that I can do as a mapper. That's (and the other one) is set so the warpzones are fully see-through. The map is made around being able to aim & shoot through them, otherwise the Mega room conflicts would be guesswork or blind firing. It might help the people who turned reflections off, or low quality thinking it was just graphical flair (like I used to do). If you still disagree with that, you can just toss the edited copy in ~/.xonotic/data/maps/. Congratulations to thimoe, the first European recorded to have played the map. Sep 21 23:40:27 <v-pacific> <Antares★ the American> ok first european to play this map, what do you think about it? Congratulations to sawa, the first girl recorded to have played the map. Sep 25 23:13:59 <v-pacific> <Antares?> what did first girl to play on antares-dm1_b1 think about the map? Sep 25 23:14:52 <v-pacific> <t0uYK8Ne> Antares? what was the intended game mode? Sep 25 23:14:56 <v-pacific> <t0uYK8Ne> tdm? pls ignore the jealous caliboy trying to impress the texas gal with his mapping skills. 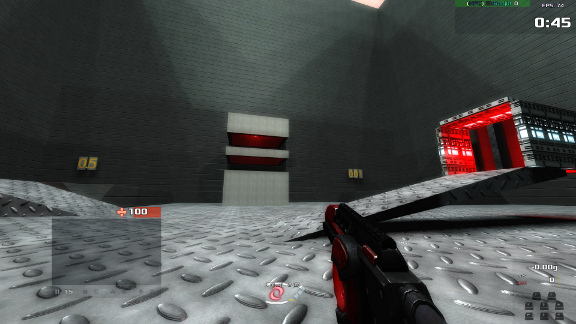 Congratulations to Antibody of Team Xonotic, the first recorded game developer to play a match on the map. Nov 14 17:48:40 <v-pacific> * t0uYK8Ne calls a vote for "-bots"
Nov 14 17:49:09 <v-pacific> <t0uYK8Ne> were you expecting that to be a jumppad? Nov 14 17:49:29 <v-pacific> <t0uYK8Ne> Have fun! Nov 14 17:58:22 <v-pacific> <t0uYK8Ne> Nice one! Nov 14 18:02:49 <v-pacific> <t0uYK8Ne> Nice one! Nov 14 18:04:38 <v-pacific> <t0uYK8Ne> Good game! Finally got a chance to play it. Very cool map! I very much like how there are so many special windows for various strategies. Hey I tested your map and it's cool. I like the idea of using those warpzones in mindfucking ways like these. 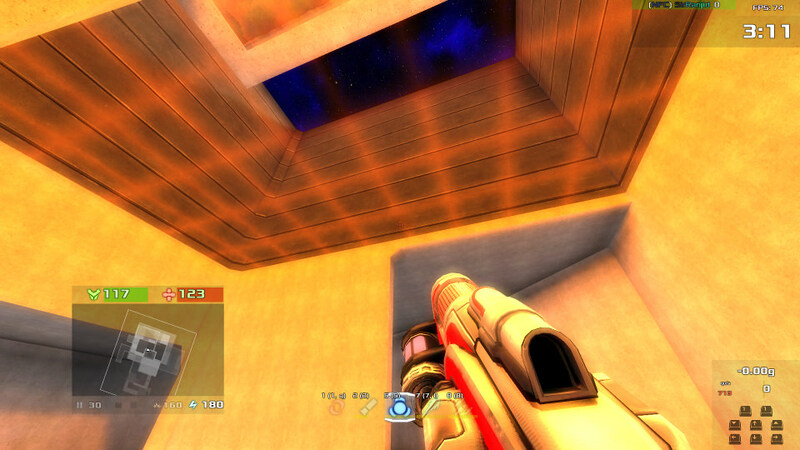 That sniper room did confuse me for a second because I was expecting to be ported across the map. That center area is really cool but needs some tweaking. I hate how water now blurs and tints your screen(that level of immersion i do not apprechiate) entirely so you wanna leave it. I feel like I could easily snipe you from the lower entry portal in that when I notice you swimming in there. and the center-gl-warpzone-room(hourglass) I took some more time to make it usable in a way I would play it because it's a really cool feature and removing it kinda destroys the whole map as it is now. I added some red lights for me to find the portals easier. And swapped the glass texture because iirc the texture you used werent so static so I used this which works for me. The dumb thing is I modified it in another map, got it working but in your map the trigger_gravity and trigger_impulse aren't working at all. I dont know why but on your map I cant get those entities to work. The trigger gravity almost completely removes gravity in that area while the trigger_impulse multiplies your acceleration by 3 each tick so you can float through it in both directions. 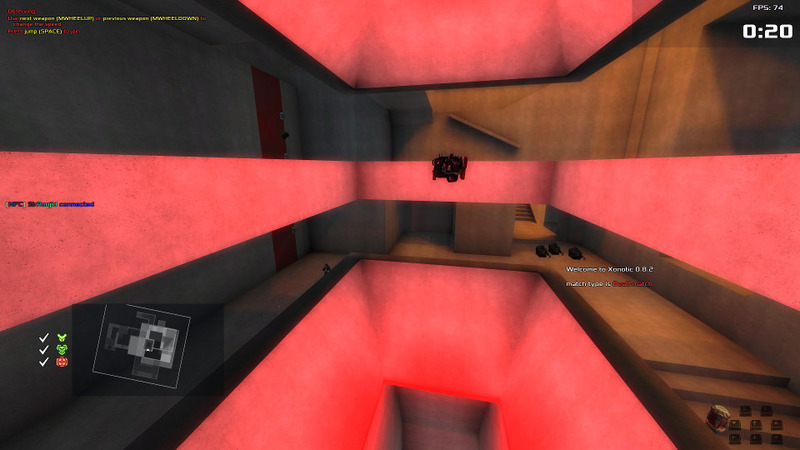 Ther numbers on the walls are the gravity multiplier and 2 areas -marked with white stripes- also have trigger_impulse. The second map i made is simply called 'gravtest' and only accessible via console. There the hourglass works and compiles faster for testing.